If you love crocheting gifts, these cute handmade tags will make the perfect final touch for them! Below you will find the all the links to download and print them for free! One of my favorite things to do when gifting something to someone is packaging it up and making it super special! I love all the little details and special touches you can do when wrapping up a gift and having a cute little tag is one of them! 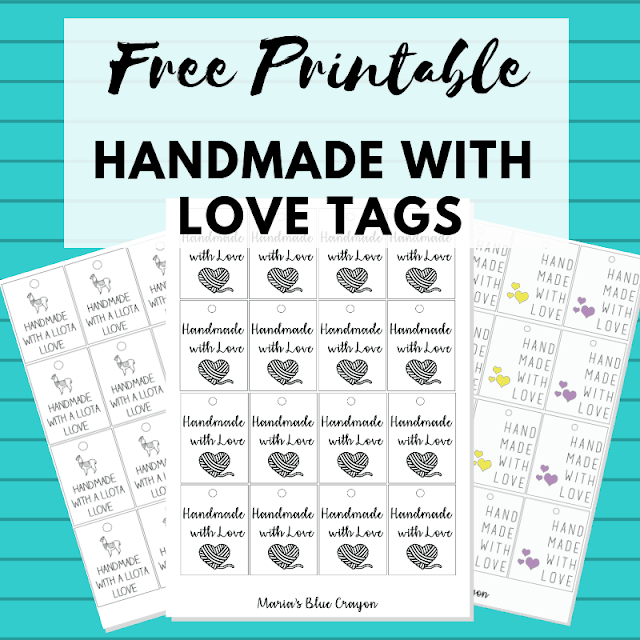 These printable tags are great for any handmade gifts – especially the ones made with yarn! Each small tag measures roughly 2″ x 2.5″ with a circle template on top to hole punch. Simply cut out the tag, hole punch, and then add twine, ribbon, or yarn to attach it to your gift! Takes just a few minutes, but adds such a special touch to your handmade gift! Down below I have a handful of different types of tags available for you to print! I will keep adding more throughout the year with different themes so you will have a variety to choose from! Simply click on the description of the tags listed below that you would like to view/print. This will open up the file and you will be able to print as many as you’d like! Enjoy! Make sure your printer is on and ready to print. You may use card stock for a sturdier tag or you may use regular computer paper. Print at your local Office Depot/Max. This post by A Crafty Concept shows you how.